Using pet food coupons can help you purchase a healthy food for your beloved pet at less than retail cost. When your pet is running out of food and you do not have a coupon clipped from the sales flyers in the paper, check online for a printable one that can save you money. Purina - The coupons and offers page on Purina's website features current promotions on the company's dog food products. Rachael Ray Nutrish - Sign up for a free subscription to the Rachael Ray Nutrish newsletter and receive a coupon for your next purchase. Hill's Science Diet - A selection of dog food coupons can be found on the special offers page on the Hill's Science Diet website. Nutro - You can sign up for a newsletter (scroll to the bottom of the main page) to find out when Nutro has special offers. Meow Mix - Register with Meow Mix to receive coupons and special offers by e-mail. Temptations - Register with Temptations to receive special offers via email. Additionally, you can "like" Temptations Cat Treats on Facebook and receive a coupon to use on your next purchase. 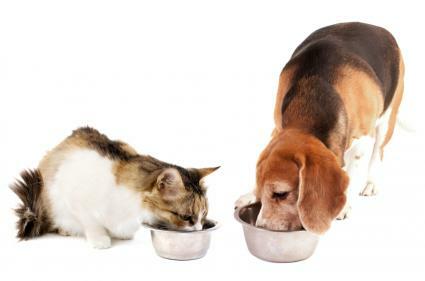 Blue Buffalo - Take Blue Buffalo's cat food brand comparison test and receive a coupon for a discount on your next purchase of any items in the product line. Friskies - Sign up on the Friskies website to receive coupons and special offers from Friskies. Pet supply stores often have their own special offers. Sometimes discounts are available storewide, while other times special savings programs are available for particular products or brands. Petco - The Petco coupons page is updated weekly and may feature in-store and online coupon offers. PetSmart - Sign up for PetPerks to receive special offers by email and a card you can use every time you shop. Also see the company's shop local page for special sales specific to your area. Halo - Use the special offers here at the Halo Purely for Pets store in your area. Coupon offers change frequently. If you don't see your favorite brand or store listed here, visit the company's website and look for a special offers page or e-newsletter registration page where you can sign up to receive special promotions. Also do a search on Facebook to see if your favorite brand has a page there, as companies often share coupons with new fans and publish special offers to their Timeline feeds. Printable pet food coupons are quick and easy to use. Get in the habit of checking online for coupons and special offers before each visit to the supermarket for maximum savings. Make sure your ink cartridge is full and that your paper is properly aligned in the printer so you do not have any problems getting your money saving coupons today.